Ops, forgot to add, minor issue tho. you can add any armature, delete everything and add a single bone, while I fix this. I am experimenting with it, it is good! The envelope system is very helpful in building the rough shapes indeed. But there is a difficulty, somehow in its use. To my opinion the best way would be to make the spheres editable, so that the connections between them may follow their shapes. Now someone can move the spheres but can not scale them, so there appears a difficulty to construct the needed shape. Maybe there is a way to do such a thing which escapes my attention… if there is, which is it? You press Alt + S to scale it. I didn’t know that either. But I don’t work with armatures a lot. Armatures are a great tool for having a rough figure on which to sculpt Metin. You have to try them. And in the add-on here there has been made a very good work on implementing such a tool. You almost have the ‘z-spheres’ of Zbrush in Blender. And they can be developed even further. Thanks @Fatesailor. I know, I was referring to the Blender armature. That’s what I don’t use a lot, because I hate rigging. Hence I didn’t know the Alt + S shortcut to scale a part of the Sculpt Toolkit mannequins. I see so many people asking about this that I’m almost thinking in replacing the armature manequins with dynamic objects, kinda like elipsoids with Stretch To constraints and lots of shapekeys that can be fused by boolean operations. I do suggest that you do it as a choice only. The zshpere like armatures -if you mean them- are very useful. I did some tests today and they are very handy. It would be a pity if you withdraw them from the add-on. I agree with @Fatesailor. I’m not bothered by the armature approach of the mannequins. I think it’s working fine. I just didn’t know (or remember) the Alt + S shortcut to resize armature elements, but now I know (again). I was even making an prototype of a replacement for the armature bones. Hmm… This doesn’t look bad at all. It pleasantly reminds me of a tool I’ve always missed since it was discontinued. It was named Clay Studio Pro, and it was a 3ds Max plug-in that allowed you to use spline-based metaballs. In other words: you manipulated spline points, gave it a thickness, and intersecting splines automatically blended into each other. I’ve been working on the pie menu layout as well as trying to discover how to reproduce @EdDiesel 's problems. here’s how things are going. I plan to make a brush shortcut editor for this pie menu. Interesting. Pie starting to look a little cluttered but the brushes are there. In 2.79 I see you have one box that displays active brush. Does 2.8 allow you to have something similar. Just select box then drop down appears for all other brushes? Just curious. Also if its not to much, perhaps add an option to toggle brush menu off/on? 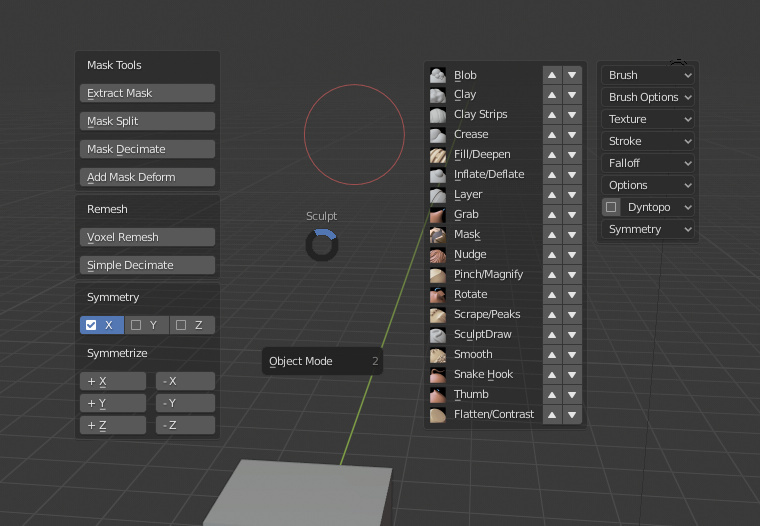 I found out about a week ago that there is a way to set tools menu to space bar in the settings which displays similar list of brushes while in sculpt mode. Having the toggle option will allow users that decided to use space as tools menu to access brushes that way. If not they can have it enabled in addon saving them some space in pie menu. Any news about those new flexible armature types? nope, I’m still on refining the interface, I want to release a usable version before starting working on this since its not guaranteed to work and I don’t want to waste time. I also got a bit delayed since I’ve acqured the computer vision syndrome recently and need to recover. Sorry to hear that you have such a problem. Wish you quick recovery. I’m also sorry to hear that, and hope you get well soon. Thank guys, I just have to sleep more. Anyway here’s a WIP of how things are going. Not all the features are shown but the most.